After having doodled for about 24 hours, my project “I Am Johan’s Sculpted Doodles” have reached the end of the line. Experiment over! Alright. 24 hours of sculpting done. Time to move on. But hey, it did yield some interesting results. 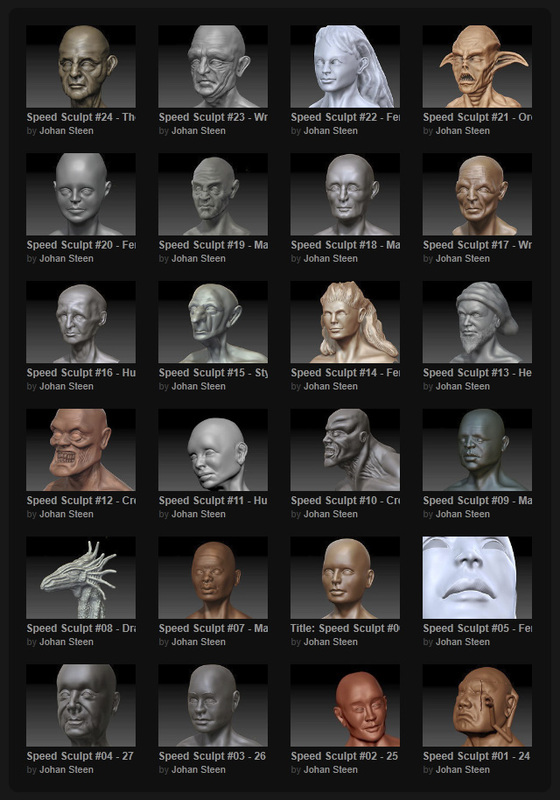 But before getting our hands dirty doing some analyzing, here is a chart of all sculpts done. I entered this experiment with a few basic rules, the most notable ones were that I had to stop after 60 minutes and that I couldn’t use any references. The 60 minute time limit was simply so I wouldn’t find any excuses not to doodle. I can always spare 60 minutes instead of watching some crappy show on the telly or similar time wasters. And the no references part was simply to force myself to train my inner eye. I must say that this is the best 24 hours I’ve spent in a long time. The learning experience have been fantastic! I actually find it quite amazing how much difference 24 hours of practice can make. Taking a look at the screenshot below, one of the first sculptures and the last sculpture from this experiment. 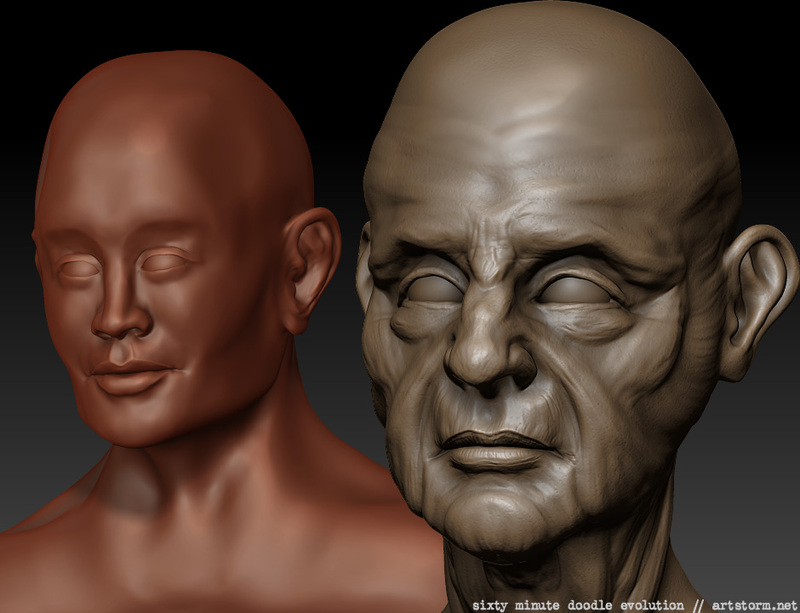 Quite a difference how far I can take a sculpt in 60 minutes now compared to when I started this journey. Perhaps not as interesting for the casual viewer, but I love to nerd-down in my endeavors. When I analyze my time-lapses and how my techniques have progressed from the first videos to the last ones I am thrilled to see all the evolution. Especially in my anatomy understanding. The fact that I worked without looking at any references is probably a major reason that have forced myself to better understand anatomy and proportions. I’m kind of seeing everything much clearer now and I don’t need to be winging it anymore like I used to do, but are now much more in control of where I want to go. I also learned something interesting which I hadn’t realized before. When working with a time limit I quickly saw a pattern that when I went towards a female look I came nowhere near as far into the process as when I went with a male look until the time was up. I had never reflected on this before that I need much more time to get a female to begin to look properly than I need for a male. I actually got so interested in this phenomenon that I did some research on the subject a few days ago, and it turned out that this is very common. It’s the same in drawing. You can either draw male or female likeness faster than the other. This is definitely something I need to work on to even out. I actually wouldn’t mind keep going with these 60 minute doodles, as I felt that I made huge progress for every new head up til, and including, the very end. There is still many, many more advancements for me to conquer on these subjects. But I was getting tired of the time limit though, and also spending time building the base when I was not allowed to use base meshes. I actually prefer to start with a base mesh from my 3D package, but for this particular exercise I wanted to make everything from scratch, so I didn’t get any help with the proportions. As this experiment has really helped me to step up my game to the next level, I’m eager to come up with a new concept to continue evolving my techniques in a fun and productive way. I’ll see what I can think of next. I can highly recommend doing projects like this if you’re looking to improve your skills.